Steve Heiting fishes fast. His objective is to cover as much water as he can to contact as many active muskies as possible. Since he is primarily a caster, Steve relies on bucktails as his primary presentation during the warm water months. In this all-new DVD, Steve explains how he fishes bucktails and why they are his go-to bait during a large portion of the musky season. 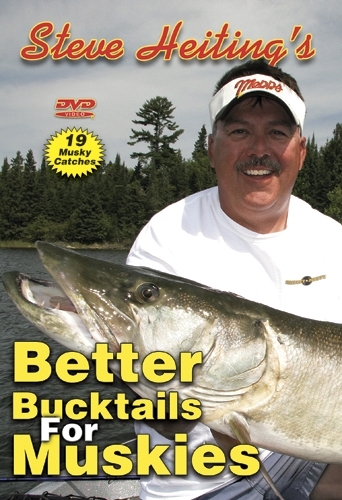 Not only does this fast-paced, professionally-edited DVD contain the solid musky information you've come to expect from Steve Heiting, but it features exciting battles with 19 musky catches from cast to release. Steve's friends say he fishes faster than anybody they know. After watching Better Bucktails For Muskies, chances are you will never fish a bucktail the same way again. • Bucktail Basics: An explanation of bucktail differences and how they are merely tools to get the job done. • Bucktail Retrieves: How to make your bucktail more appealing to more muskies. • Bucktail Considerations: Simple tweaks and modifications to make bucktails more effective. • Bucktails At Their Best: Recognize the conditions when a bucktail should be the first bait out of your tackle box. • Figure-8's At The Next Level: Three-dimensional figure-8's, big ovals, and the "hang" move.